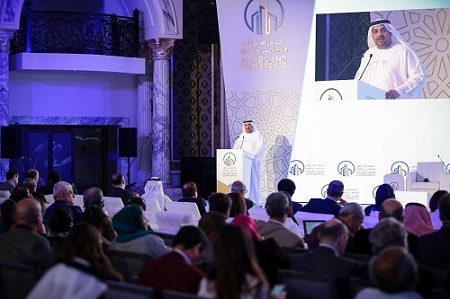 The conference, organized in partnership with the World Bank, the Global Land Tool Network, UN-HABITAT, the League of Arab States and the Arab Surveying Association, was attended by more than 300 participants, representing several regional and international bodies. Dubai Land Department General Manager Sultan Butti Bin Mujrin opened the conference, saying: We were delighted to welcome and participate with a large number of representatives from governments, international and non-governmental organizations, reflecting the importance of the topics covered by the conference. In order to find successful solutions to the various challenges facing the land sector in the Arab world, which is clearly demonstrated by the list of recommendations issued by the conference, which will benefit the various activities and activities of the dispersion, and all segments of society. The United Nations High Commissioner for Human Rights’ Regional Representative Abdel Salam Sidahmed introduced the efforts underway to produce the MENA Handbook on the “Pinheiro Principles” for prevention, mitigation and resolution of rights violations in the region. Laura Cunial (NRC) and Karolina Lindholm Billing (UNHCR Lebanon) each shared lessons from the field and posed recommendations for improvement in the restitution of lands to refugees in the Arab region. The afternoon session of Day 2 of the conference featured the follow-up Technical Session on “Protection of Land and Property Rights of Displaced People and Refugees. That session, moderated by Jamal Mahmoud Hamid, Minister of Urban Planning – Khartoum State (Sudan), featured five experience exchanges that covered four country-specific cases and one regional diagnosis. HIC-HLRN Coordinator Joseph Schechla addressed the “Challenges and Priorities for Arab Land Restitution within International Law Norms.” In his presentation, he laid out the normative international law framework that guarantees refugees’ and IDPs’ HLP rights and binds states to respect, protect and fulfill them. While pointing out that the legal norms have the purpose of positively affecting behaviors and outcomes in cases of impending and actual conflicts and disasters, the non-application of those same norms has had a consistently corrosive effect arising from “protracted impunity” for gross violations and crimes that violate HLP rights without remedy. On the sidelines of the last day of the conference, the roundtable sessions and “masterclasses” were organized with a number of specialized and technical experts, during which various topics were discussed. The most prominent were: Land indicators in the goals of sustainable development and their application in the Arab region; Rural communities in responsible governance of land, land and conflict in Arab States: role of voluntary guidance on responsible land tenure governance (VGGT), conflict-sensitive land tools in conflict prevention, peace-building and reconstruction, capacity development initiatives in support for good governance of land and fitness for the purposes of land management, and women, and the means of social communication and access to land. In the masterclass on “Land Indicators in the Goals of Sustainable Development and Their Application in the Arab Region,” HIC-HLRN’s representative raised the prospect of integrating already-standing reporting methods and data arising from states’ reporting obligations under human rights treaties. In the last day’s roundtable on “Land and Conflict in the Arab States: The Role of the Voluntary Guidelines on the Responsible Governance of the Tenure of Land (VGGT) and of Conflict-sensitive Land Tools in Conflict Prevention, Peace Building and Reconstruct,” the HIC-HLRN coordinator served as an invited discussant. In his intervention he emphasized again the need to align processes to repair the UN System’s fragmented approach to land and conflict, taking lessons from the UN treaty-monitoring bodies, prioritizing state obligations over temporal commitments, ensuring accountability, and seeking harmony among the three purposes of the UN Charter: (1) peace and security/humanitarian assistance, (2) forward development and (3) human rights. In the closing ceremony, the conference honored the United Arab Emirates for being ranked first among Arab countries in the speed and volume of real estate registrations and 10th in the world, as noted in the World Bank`s Doing Business 2018 report. The Hashemite Kingdom of Jordan was also honored for the development of its real-estate business during the past year, rising in rank from 96th in the world to 72nd in the World Bank’s category on real estate registration. At the same event, the delegation of the Kingdom of Bahrain at this conference found an opportunity to announce the launch of the Real Estate Regulatory Authority (RERA), and Naji Sabt, Director General of Survey and Board Member of RERA, announced the launch of its work the day after the conference. The delegation expressed its pride in this step that they hope contributes to making the kingdom one of the investment destinations in the region in a way that supports the vision of the country`s leadership and government. Under the title Dubai Declaration on Land Governance in the Arab States, participants in the first Arab Land and Property Management Conference, representatives of governments, the private sector, civil society, academia, professionals, international and regional organizations and relevant stakeholders, made this announcement and emphasized the objectives of the conference, exchange of knowledge, enhance regional cooperation, develop capacity, and stimulate innovation in land management and real estate reform, in order to promote social and economic development in the Arab region. The recommendations addressed the need to modernize land management, administration and governance in Arab countries to ensure full protection of land as a property right; promote social and economic development and investment, economic diversification and facilitate improved service delivery; and ensure the sustainable use of land resources for the current and future generations. On a more socially oriented note, one of the recommendations identified the most pressing challenges, particularly the need for full protection of property rights for all segments of the population, land use and land-related conflicts, difficult access to land for women, youth and marginalized communities at affordable prices, land tenure security for vulnerable urban and rural populations, the accuracy and effectiveness of land management processes and practices, and the need to improve the capacity of regional and local institutions to address the challenges of land management in a comprehensive and integrated manner. In conclusion, the participants called for the continuation of this effort, through the promotion and deepening of knowledge sharing, research and capacity-building among Arab States, to further develop land management and real estate reform for the benefit of all residents of the region.